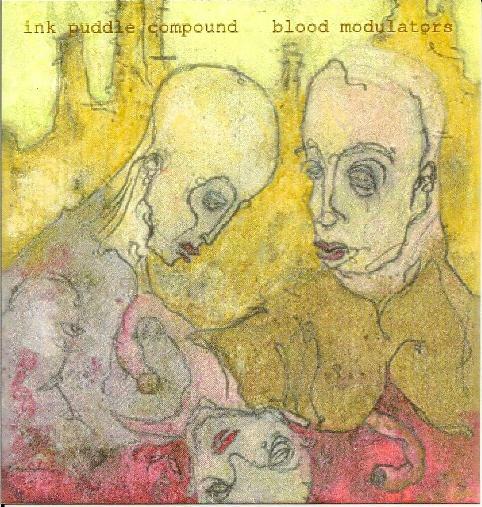 Ink Puddle Compound - "Blood Modulators"
Lasting around 14 minutes in length, the 6 tracks are strange to the ear. They are quiet and sad sounding, much in the style of Damien Youth. They are also part acoustic in nature accompanied by synthesizer and blowey/hitty things. The tempo is slow throughout; it sets the tracks firmly somber and reposed. The mood created is part hypnotic, part ethereal, and from the acoustic styled minor key arpeggios to synthesized minor key pads this somber mood flows between the two styles with ease. The structure of the tracks is thoughtful as to where it will end before it begins, and the sound quality carries the minimal tracks nicely into the slightly more energetic pieces without much ado. The synthesizers bubble and attack us like landing spacecraft and I find it an interesting listen. On the whole it is inoffensive to the ear, it floats well throughout, and the moments of sadness and woe will not leave you too distraught.